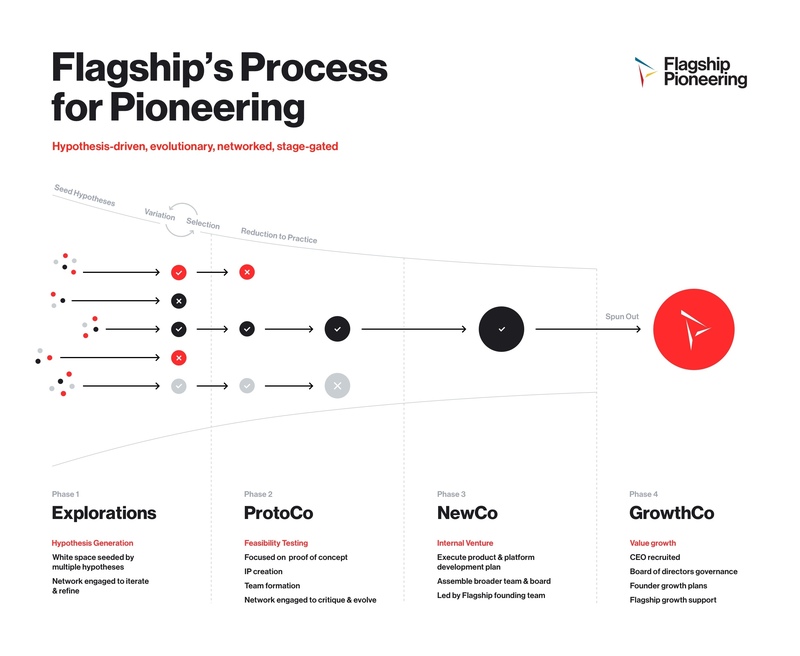 Flagship Pioneering is an experiment in institutional innovation. What if there was a band of insurgents who possessed the institutional advantages of an incumbent, but retained the creativity and adaptability of pioneers? Our unique model combines scientific creativity, technological ingenuity, systematic entrepreneurship, executive leadership, professional capital management, and a vast network of experts in a single institution that produces first-of-their-kind businesses. We are the principal founders, funders, and owners of our companies, taking responsibility for their long-term success by providing them with all the resources of our ecosystem. Flagship Pioneering CEO and Founder Noubar Afeyan on systematic innovation. Pioneering is: Being the first to create valuable ideas by directing scientific innovation and entrepreneurship at unknown spaces, far beyond the adjacencies that incumbents pursue. We begin with seemingly unreasonable propositions and navigate to transformational outcomes. Flagship Labs poses farfetched hypotheses, exploring the question “What if...?” Our entrepreneurial scientists allow hypotheses to evolve through variation and selection, collaborating with external experts to test the weaknesses and strengths of new concepts. We create better and better hypotheses until we identify something that might be a breakthrough, if only it worked. We call these imaginative inquiries "explorations,” and conduct 80 to 100 a year. Promising explorations become prototype companies, or “ProtoCos,” and are assigned a number according to their place in the series of Flagship Labs ventures: “FL1,” “FL2,”… “FL63,” etc. Flagship Pioneering founding teams test concepts, and discontinue ProtoCos that cannot, for whatever reason, validate their science in the laboratory. We use the word "origination" to mean the conception, iteration, and launch of a new company around a distinct breakthrough. We originate eight to ten ProtoCos every year. If the founding team can plausibly convert the question “What if…” to the answer, “It turns out...” a ProtoCo becomes a new company, or “NewCo,” with a name and significant capital commitment from Flagship. Each NewCo focuses on developing a proprietary platform that will deliver years of important new products, and recruits a board of directors, CEO, and leadership team. We form six to eight NewCos a year. Ultimately, a NewCo is spun out to become a growth company, or “GrowthCo.” A GrowthCo’s leadership team attracts outside investors, forges partnerships, and builds a business that creates extraordinary future value, often operating as public companies. Seventeen of Flagship Pioneering’s GrowthCos have completed IPOs since 2013.